Enjoy the sunset from your balcony on this fifth floor modern style condo, located in Costa Linda, only 300 meters away from the beach in north Jaco. This exclusive residential community is ideally located, walking distance to the beach, restaurants and bars, movie theater, super markets, etc. The condominiums shared amenities including a large pool, kids pool, 3 playgrounds and 5 BBQ areas. Parking and 24 hour security at the gate. Elevators are present in all buildings. 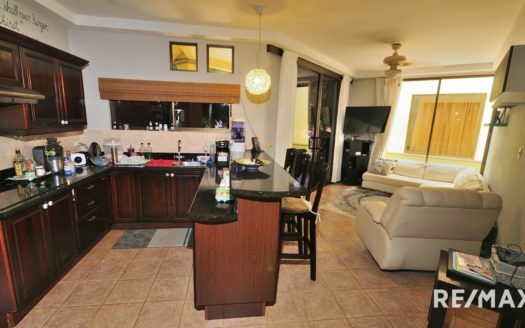 Located on the fifth floor, this unit is overlooking the pool area and gardens. The furnishings include hardwood furniture and a very comfortable leather-like living set, together with modern appliances such as a stackable washer and dryer, ceramic top stove/oven with air extractor and large refrigerator. This is an excellent opportunity for a income producing vacation/rental investment. Contact me for more information on this Costa Linda Condominium, or for any of your Costa Rica Real Estate needs.